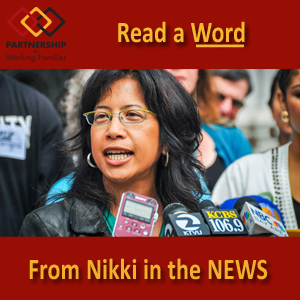 Across the country, the Partnership for Working Families is raising the floor for low wage workers and pushing back on employer attempts to avoid direct responsibility for their workers’ wage, benefit, and safety standards. This week, we celebrate three exciting developments. As workers join forces nationwide to fight for higher wages, many other workers are fighting just to get paid the wages they were promised. In Massachusetts, Community Labor United (CLU) and the Good Jobs, Strong Communities Campaign introduced a state bill that would address the wage theft crisis. With over 100 co-sponsors, An Act to Prevent Wage Theft and Promote Employer Accountability defines key employment terms to better clarify which employers in a multi-layer hiring model can be held accountable for violating labor law standards. It also strengthens the penalties for violations, and enables workers to sue violators directly instead of first filing a complaint with the state Attorney General. Mario Alvardo, a janitor, explains the problem of wage theft, “As a janitor for US Kleanway cleaning theaters the workload was so heavy I often had to ask my wife to help me finish. My wife was never paid for her time, and I was underpaid, receiving only $100 a day. I didn't get overtime, I didn't get meal breaks, and I wasn't given any health or safety equipment. When I got together with a group of five other coworkers to demand fair pay and fair treatment, US Kleanways fired all of us on the spot. It took a year with the help of Chelsea Collaborative and a coalition of community and labor organizations protesting at AMC Loews Theater to pressure US Kleanways into paying tens of thousands of dollars in the wages and overtime owed to my coworkers and me." Learn more from CLU’s new report: Gaming the System: How Employers Short-Change Workers and Get Away with It. Working Partnerships USA and Silicon Valley Rising’s campaign that seeks to improve the standards for contract workers in the tech industry was bolstered yesterday by Facebook’s announcement: It now requires contractors to pay a $15 minimum wage, 3 weeks paid time off and $4,000 in support for new parents. The company took the first step when its contract shuttle drivers organized with the Teamsters union. Now, this extraordinary move begins to recognize that corporations can and must act for their contract workers. Security officers, janitors, food service workers, and shuttle drivers are leading the way! In Emeryville, CA – Oakland’s neighbor – the city council unanimously voted to raise the city's minimum wage to $12.25 for small businesses and $14.44 for large corporations with 6-9 paid sick days and cost of living increases. The two wages will converge to almost $16 by 2019, making it the highest in the nation. Partnership affiliates including Puget Sound Sage in Seattle, LAANE in LA, Center on Policy Initiatives in San Diego and POWER in Philadelphia have all either won or are in the process of moving minimum wage legislation forward. The Partnership is innovating, just as workers have innovated for years to stretch a dollar to make it on minimum wage. Take a look at Partnership Executive Director Nikki Fortunato Bas’ recent op-ed about how small businesses are innovating too and how giant corporations need to catch up on raising wages. The Partnership’s 2x2 Campaign to improve 2 million lives in 2 years is gaining momentum. Over 150,000 workers in Seattle and Oakland got a raise earlier this year. Following Emeryville’s win, LAANE is leading the charge for a comprehensive policy to win a higher minimum wage, paid sick days and wage theft protections for 1 million workers in the City of Los Angeles. Many other Partnership cities are also campaigning to raise the wage, provide paid sick days, end wage theft, create career pipelines into good jobs and increase accessible transit and affordable housing.